Finding the right mouse pad for your desk can be tough. You want something comfortable, but something that looks professional. Well, we have the solution with a leatherette mouse pad with wrist support. Comfortable AND classy! This mouse pad is a rounded shape with a puffy wrist rest at the bottom. 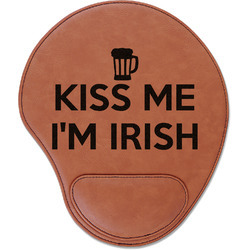 The gorgeous cognac leatherette mouse pad really will be the perfect accessory for your desk space. Strong stitching goes along the edge of the mouse pad to ensure stability and strength. Your mouse will be able to smoothly glide across the surface quite easily. 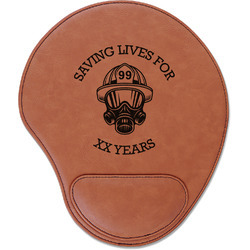 Your laser engraved design will be placed on the main area of the mouse pad where you will use your mouse. Choose a fun shape, font, or monogram to personalize your mouse pad. Even upload a logo or business motto! Make it yours. And if you are ever in need of any assistance, just give us a call. We are always happy to help. Looking to finish decorating your desk area? Go no further! We have the perfect Office section to browse in order to find exactly what you need. We have everything from sticky note cubes, to wrist rests, to pencil holders! Be sure to check these out before you go.